Yup, I’m 39 today. I walked into my office this morning (a little earlier than usual), and it was decorated – balloons, confetti, banners, the whole deal. Today will be just another day in the office — I’ve got a full calendar, a lot of email to catch up on, and lots of stuff to get done. Tonight we have the big kiddos, and we’ll go out to dinner like we do virtually every Tuesday night (Peri has art until 6pm, so its the best choice). I dressed up a little bit for work today… heels and all! (no makeup though…) It is *my* birthday after all. 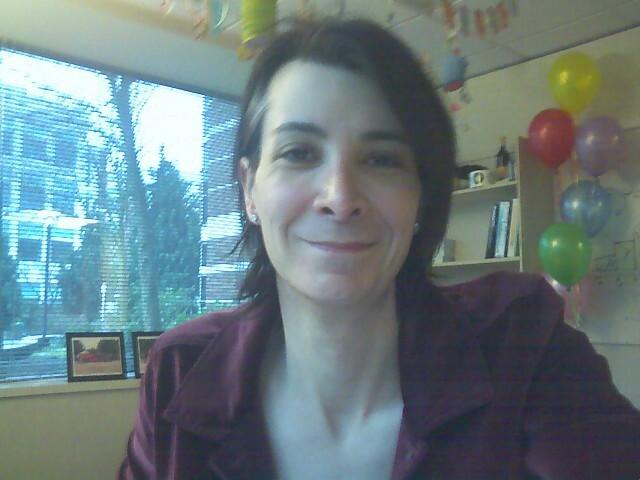 Lots of changes since 38 – Samwich, my job, my gender, but hey! Its all good! Sounds like things are going well. Happy 39th!! You inspire me. Thank you for a wonderful blog. Happy Birthday, Megan. I can’t wait to see what 39 will bring into your life!! Very happy birthday! Great to be reading you. Heels?! You ARE a brave woman! Every time I wear those, I fall over. Grace is NOT my middle name. Anyway, I hope you had a happy birthday! It’s good to hear that your office was decorated super nice.